I started my teaching career as an English teacher in an inner-city Philadelphia school. I loved all of the pieces of teaching English, from diagramming sentences to analyzing Langston Hughes. Twenty-five years later, I’m the Elementary School Science Coordinator and Science Department Chair in an independent school in North Palm Beach, Florida. I love teaching in my K-5 science lab. I think that doing science experiments with awestruck children all day, every day is the best job in the world. My transition from an English nerd to becoming a science fanatic started with the influence of a wonderful mentor. In my experience, most elementary teachers start teaching because they have a passion for educating children, particularly in reading or math. In my teaching career, I have yet to meet a single elementary teacher who started teaching with a love of science — but I have met many who realized their love for teaching science after entering the classroom. Most elementary teachers do not have a formal background in science. Teacher training programs tend to focus on reading and math, with a few social studies or science classes sprinkled in. This leaves us with a cadre of teachers who are dedicated and caring, but poorly trained in the sciences and, as a result, are often fearful of science. 1,2 I was in this category. I grew up in a science-y household (my dad was an aeronautical engineer) but I lost all love of science during high school chemistry. I finished that class with the impression that chemistry is hard and dangerous, especially for younger students. That’s what I thought for a long time. I hesitantly moved from Philadelphia to Westport, CT to start my new position teaching sixth-grade math and science, rather than English. Although I wasn’t thrilled about my new assignment, this is where I encountered my first science mentor. She was so enthusiastic and helpful that I caught her bug, and have never looked back. Within two years, I was teaching exclusively sixth-grade science and was also the science team leader. I’ve been a science teacher for over 20 years now. I spent years reeducating myself on biology, physics, and earth sciences to prepare for my classes. I found that there is a great deal of very accessible information on those topics in books and online. But I still steered away from chemistry, because it intimidated me. I did very basic bits and pieces of chemistry in my teaching, like mixing baking soda and vinegar, or oil and water … but I didn’t give my students a cohesive explanation of what was happening — I just enjoyed sharing the “wow” factor. 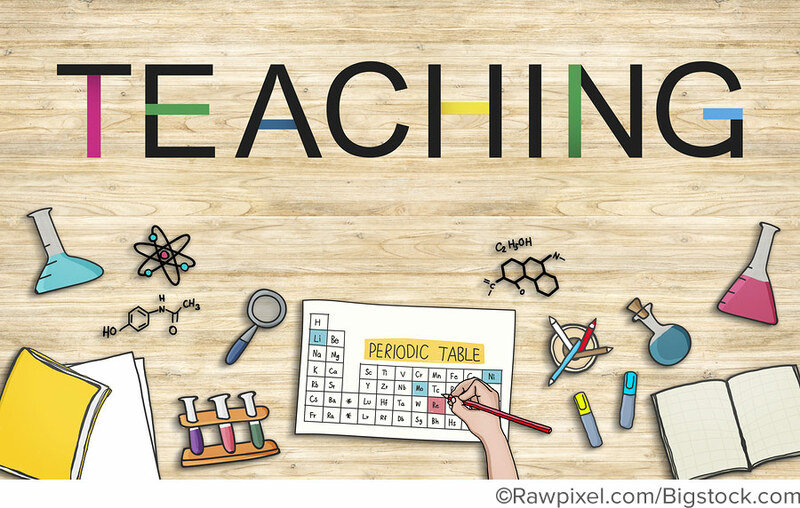 A few years ago, I realized I was doing my students a disservice by letting my own bias get in the way of being an effective chemistry teacher. I was raising a generation of students who would be just as ignorant and fearful of chemistry as I was. I started hunkering down to try to understand more chemistry, but hit a brick wall. The only websites I was able to find either just focused on the wow factor that I had been relying on (with no facts or explanation), or were so dense that I became frustrated. When I found AACT, everything changed for me. The website was easy to follow and provided a large variety of grade-appropriate lesson plans that I could use in my classroom. I also found a mentor through their Science Coaches program who once again changed my teaching. The best part of all this was that my mentor showed me that I had actually already been teaching chemistry, even when I thought I that wasn’t. She taught me how to modify my language in order to use chemistry terminology and highlight chemistry topics within my teaching. She also encouraged me to add more depth to my experiments and explore new possibilities in those experiments. Motivated by these recommendations, I have made a lot of beneficial changes to my science lessons. For instance, are you familiar with the baking soda and vinegar experiment? We’ve all done it. Teachers combine vinegar and baking soda to demonstrate an example of a chemical change. While doing this simple reaction, I used to mention that vinegar is an acid and baking soda is a base, but that was as much as I would explore. My mentor helped me to realize that there are actually a number of ways to further teach chemistry concepts based on this basic chemical reaction. I now teach an entire unit to my second-graders, still beginning with the baking soda and vinegar reaction, but then using it as a foundation to investigate several other concepts and real-world examples. This approach could be modified to use with any elementary-level science class with minor adjustments. For the first lab investigation, students use graduated cylinders and measuring spoons to measure quantities of vinegar and baking soda. The amount of vinegar is held constant and students complete multiple reactions, adding varying amounts of baking soda, starting with a ½ teaspoon and increasing by ½ teaspoon increments until two teaspoons is reached. During this experiment, students will determine if the amount of substance used has an effect on the reaction. A second lab also uses the baking soda and vinegar reaction, but this time students measure the temperature change that occurs. Students are always shocked that the temperature decreases during the reaction between vinegar and baking soda. This helps them to understand that temperature changes in a chemical reaction, teaches them to use vocabulary to explain their observations (such as endothermic and exothermic), and stimulates their thinking about energy transformation. I always make an effort to connect what I’m teaching to everyday applications so that the students can better understand the purpose. I live in Florida, where the terrain is primarily composed of limestone. This limestone is critical because it purifies our drinking water. With this in mind, in the third experiment, students are given samples of different type of rocks, including limestones. They use droppers full of vinegar to investigate the composition of the rocks. Students are asked to separate the rocks based on whether or not they react (bubbles are produced) with the vinegar. 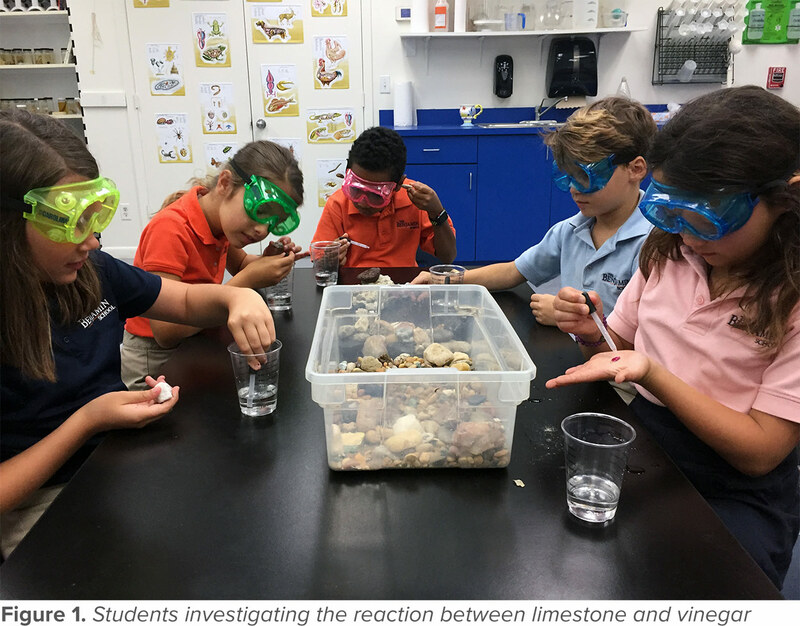 They also examine the physical properties of the rocks that displayed evidence of a reaction when they encountered vinegar, in order to determine if they all look and feel the same. Limestone rocks react with vinegar due to the presence of the base, calcium carbonate, contained in limestone. Although I teach this lesson to my second-graders, I take the opportunity to revisit it with my fourth-graders when we study geology and sinkholes. Please note that students should always wear safety goggles when using chemicals, including common household chemicals such as vinegar and baking soda (as shown in Figure 1). I also use candy as an exciting topic in our final, culminating lesson in this series. This is when we learn about the connection between the sour taste and the pH scale by partially dissolving a variety of sour candies in water, and adding a fixed amount of baking soda to the water mixture. Older students use pH indicators to test the pH, while younger students observe the familiar production of fizz from the acid-base reaction. They organize their dissolved candy results in order from the most to the least fizz produced. The amount of carbon dioxide (fizz) produced helps the student make a connection between the results and acidity of the candy. The more sour the candy, the more acid is present in it. You can have students then identify where the candies belong on the pH scale. A final real-world connection that parents tend to appreciate is that the more acidic a candy is, the more damaging it is to teeth! This is just one example of how to expand a simple chemistry lesson originally used for the wow factor into a more meaningful chemistry unit. It doesn’t have to be hard or scary. Chances are, you are already teaching chemistry anyway — you might just need to highlight it. The most rewarding part is how excited your students will be! Connecting with a mentor has been an extremely valuable experience for me. Having someone available to share their knowledge, answer chemistry questions, and provide guidance has been a great experience. AACT has a great Science Coaches program for this exact purpose, but you can also reach out to the middle and high school science teachers in your district for support. In my experience, they are thrilled to help you prepare the students who are coming their way in a few years. 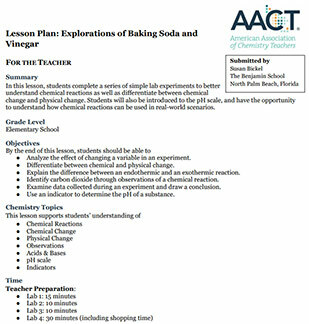 There are also online message centers where you can ask basic chemistry questions and many of the science supply companies have lesson plans that go with their chemistry supplies. The AACT Discussion Board is a great place to get questions answered online by K-12 teachers across the country! Make sure to check out the AACT Elementary Resource Library, where many lessons are already available for your use. And remember: your students love chemistry and, by extension, will love being your student. Davis, E., et al. Challenges New Science Teachers Face. Review of Educational Research. 2006, 76, No. 4, 607-651. Bohn, J. Why Elementary Science Instruction is Critical Today. http://edge.ascd.org. Jan. 3, 2017. Susan Bickel has been a teacher for 25 years. She currently is the Science Coordinator and Science Department Chair at The Benjamin School in North Palm Beach, FL for children age 3 through 5th grade.